Recently I’ve been enjoying dirty thoughts. I spend my days in a sterile 8x10 room practicing family medicine and yet my mind is in the soil. This is because I’m discovering just how much this rich, dark substance influences the day-to-day health of my patients. I’m even beginning to wonder whether Hippocrates was wrong, or at least somewhat misguided, when he proclaimed, “Let food be thy medicine.” Don’t get me wrong—food is important to our health. But it might be the soil where our food is grown, rather than the food itself, that offers us the real medicine. You would find little to support these assertions within the medical literature. Enter the terms “soil” and “health” into a PubMed database and the top search results portray soil as a risky substance, filled with pathogenic yeast, antibiotic-resistant bacteria, radon, heavy metals, and pesticides. But move past these grim reports, and you will uncover a small, but growing, collection of research that paints soil in a very different light. These studies suggest that soil, or at least some types of soil, can be beneficial to our health. The scientists investigating this soil-health connection are a varied bunch—botanists, agronomists, ecologists, geneticists, immunologists, microbiologists—and collectively they are giving us new reasons to care about the places where our food is grown. 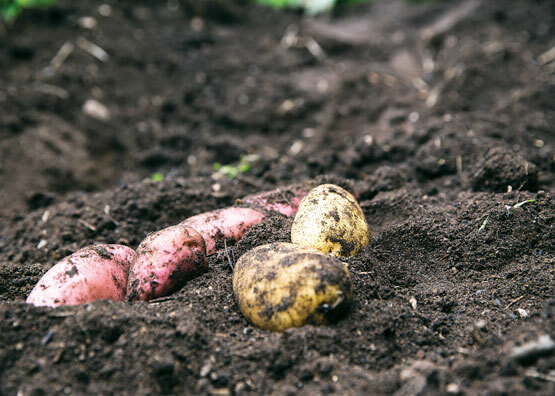 For example, using DNA sequencing technology, agronomists at Washington State University have recently established that soil teeming with a wide diversity of life (especially bacteria, fungi, and nematodes) is more likely to produce nutrient-dense food. Of course, this makes sense when you understand that it is the cooperation between bacteria, fungi, and plants’ roots (collectively referred to as the rhizosphere) that is responsible for transferring carbon and nutrients from the soil to the plant—and eventually to our plates. Given this nutrient flow from soil microbes to us, how can we boost and diversify life in the soil? Studies consistently show that ecological farming consistently produces a greater microbial biomass and diversity than conventional farming. Ecological farming (or eco-farming, as my farmer friends call it) includes many systems (biodynamic, regenerative, permaculture, full-cycle, etc.) that share core holistic tenets: protecting topsoil with cover crops and minimal plowing, rotating crops, conserving water, limiting the use of chemicals (synthetic or natural), and recycling all animal and vegetable waste back into the land. Much of this research supports what traditional farmers around the world have long known to be true: the more ecologically we farm, the more nutrients we harvest. While soil scientists are busy documenting these soil-to-food links, immunologists and allergists in Europe are working above ground to uncover another intriguing soil-health connection, the so-called “farm effect.” Why is it that children raised on ecologically managed farms in Central Europe have much lower rates of allergy and asthma than urban children or those raised on industrialized farms? Once again, almost everything points to microbes—in manure, in unpasteurized milk, in stable dust, on unwashed food and, yes, in the soil. In one study, researchers cultured farm children’s mattresses and found a potpourri of bacteria—most of which are typically found in soil. The standard explanation for the “farm effect” is the hygiene hypothesis, which contends that early life (including in utero) exposure to a variety of microbes dampens the allergic response of our adaptive immune system. The problem with this theory is that our immune system is surprisingly simplistic and seems to react similarly whether it is encountering the diverse portfolio of microbes on an ecological farm or the relatively homogeneous collection of microbes typically found in an urban apartment or a conventional farm. But what if our own immune cells are simply a backup mechanism to a more sophisticated first line of defense—our resident microbes? Of course this is all very new—and for me, as a physician, somewhat disorienting. In medical school I was taught that our internal bacteria belong to a private club and that they have nothing to do with the microbes in our external environment. Pathogens such as salmonella or E. coli might pass through, as happens when we suffer from food poisoning or other infections, but their influence was considered to be transient—albeit occasionally devastating. But now that we can sequence the DNA of an entire microbiome, using a technique called metagenomics, we’re beginning to connect the dots and we’re discovering that genetic swaps can take place between our microbiome and the outside world—particularly the places where our food is grown. A group of French microbiologists were among the first to document this game of pass-the-gene when they identified the exact same sequence of DNA in two different Bacteroidetes bacteria species, one living on seaweed and the other in the intestines of Japanese people. They concluded that the marine bacteria had hitchhiked their way into the human gut via sushi and other seaweed dishes and passed their seaweed-digesting DNA on to resident microbes of the human host. The end result of this exchange is that many Japanese—and possibly people from other seaweed-eating cultures—have acquired a greater ability than the rest of us to extract valuable nutrients from their nori. Justin Sonnenburg, a microbiologist at Stanford who studies how our environment influences our microbiome, told me that the findings from this nori study are, most likely, just the tip of the iceberg. He believes that we’ll continue to discover ways that the microbes in soil and oceans are interacting with our microbiome and playing a huge role in our health. Farmers who live on their land and feed their family from it tend to care for their soil as if it were another family member. Going to farmers markets and joining a CSA (community-supported agriculture) are reliable ways to get this type of produce, and supermarkets are also beginning to support local farmers. Remember, the more we demand it, the more they will carry it. Of course, another option is to grow our own food. Eating fresh-grown food from healthy soil is not an all-or-nothing proposition, and even a daily handful of herbs from a container garden can have a positive impact on our health. Whether it is homegrown or from a local farm, I do mention to my patients that they should think twice before peeling or scrubbing their farm bounty. After all, who knows what beneficial bacteria might be coming along for the ride? By the way, eating fermented farm-fresh vegetables is a great way to get a mega-dose of soil bacteria. I also tell patients about other (non-edible) health advantages to connecting with healthy farms. For example, although the data is far from conclusive, spending time on a local farm might offer a relatively safe, low-tech prevention strategy for families predisposed to allergies. “Farm time” looks especially attractive if it obviates the need for allergy shots or rounds of antihistamine. Emerging research says time spent working the soil is a means to build community, improve strength and fitness, slow dementia in seniors, and improve school performance in teens. It would be simplistic to promote a connection to healthy farms as a panacea for all that ails us, but it has become an important part of my medical toolkit. Similarly, while I’ve long recognized how antibiotics, steroids, and other bactericidal drugs might cause unintended side effects in my patients, I now understand how these drugs can impact the microbial life underfoot and ultimately our own cells. Thinking of a healthy body as an extension of a healthy farm, and vice versa, is a paradigm shift for many of us. But when we consider that all of our cells get their building blocks from plants and soil then, suddenly, it all makes sense. In fact, it is not too much of a stretch to say: We are soil. Daphne Miller, M.D., wrote this article for How to Eat Like Our Lives Depend on It, the Winter 2014 issue of YES! Magazine. She is a family physician, writer, and associate professor at U.C. San Francisco. Her latest book is Farmacology: What Innovative Family Farming Can Teach Us About Health and Healing (William Morrow, 2013).